Toronto Death on the tracks: How bad is Toronto transit’s suicide problem? Death on the tracks: How bad is Toronto transit's suicide problem? On the morning of his 25th birthday, Michael was in a midtown subway station, about to throw himself in front of a train. Depressed and feeling nothing was going right, the young man – who has asked not to be identified – rocked back and forth on the platform. As the train roared toward the station he suddenly realized he was weighing the pros and cons of suicide. If there were still reasons to live, he knew he shouldn't go through with it. But the compulsion to jump was strong. "My body was instinctively moving. I didn't know what I was going to do," Michael said. He turned to a man standing near him. "I said, 'Hey, please talk to me for moment.' I said, 'Please just hold me against the wall'." The stranger did as he asked, keeping Michael safe as the train pulled into the station. Once the moment had passed, they parted and Michael cried as he continued on his way to work. He battled depression for several more years, but his brush with death had scared him such that he never again got to the point of suicide. But for many desperate people the story ends differently. One hundred and forty-eight people have jumped in front of a Toronto Transit Commission train so far this decade, about half of them killed on the spot and many of the rest suffering dreadful injuries. Another 72 have died using the GO train network. What do Toronto transit agencies do when someone is struck by a train? Oliver Moore explains more below. The Globe and Mail has completed an in-depth analysis of suicide data from GTA transit providers and other sources. It paints a picture of a persistent public health threat that devastates families, ripples through witnesses and out into society and costs transit agencies a fortune. Toronto will soon decide whether to install barriers on subway platforms, a billion-dollar decision that could eliminate suicide in the TTC network. And Metrolinx, the government agency that oversees GO Transit, is looking hard at further restricting access to their rail corridor, hoping to minimize an expected spike in suicides as it moves to more frequent service. Neither approach is cheap, forcing hard decisions about how much the society is prepared to spend to save a life. "It's completely preventable, I mean, it just doesn't need to happen," said Sunnybrook Health Sciences Centre chief surgeon emeritus Dr. Robin Richards. For 33 years he witnessed the aftermath of transit suicides, working at Sunnybrook and St. Michael's Hospital, and was left frustrated by the lack of progress in stopping these incidents. "I think every effort should be made to prevent injury or suicide, no matter by what means, but [rail suicide] is like a festering sore, as far as I'm concerned, that nobody wants to talk about." Note: platform usage data is from 2015, and for Bloor-Danforth, Sheppard and Yonge-University lines combined. The GO system involves hundreds of kilometres of track and 185 level crossings, with infinite entry points, and access to the TTC is available throughout the city for a small fare. Because of this, securing a transit agency's rail lines is a particularly difficult job. And additional security can't come at the price of crippling these transportation systems. It's a problem all transit agencies wrestle with. And many have experimented with different technologies to prevent suicide. Some use lasers to raise an alert when people go near the tracks. Others install pits under the tracks to shield those who fall in, or give refuge to people who jump and then reconsider. Blue lights in railway stations have shown intial success in Japan. But blocking access to the tracks is widely seen as the most reliable method. "As it stands, reducing accessibility to train lines through installation of physical barriers is the only suicide prevention strategy that has been followed by a decrease in railway suicide," concluded the authors of a 2014 paper in the journal BMC Public Health. These barriers are costly. But not preventing suicides also has a cost, in addition to the human tragedy. According to 2005 data from the U.S. Centers for Disease Control and Prevention, a single suicide costs society approximately $1-million (U.S.). And a 2014 report from the Mineta Transportation Institute noted that the cost of suicide on railways is "potentially higher" because of the associated system delays. At the TTC, suicides and attempts have cost the system more than 6,000 minutes in delays over the last five years. Other unauthorized people at track level – including drunks, passengers who drop items, people taking dangerous selfies – have added nearly as many minutes of downtime. While the TTC hasn't quantified the number of passengers affected by individual delays, one staffer suggested "tens of thousands" would be caught up each time. Using standard analyses for transportation projects that peg the cost of lost time at upwards of $20 per hour per person, these delays are adding up to many millions of dollars each year. Platform barriers – which have sliding gates that open in unison with the train's doors, allowing access to the vehicle but not the tracks – promise to slash those costs. A TTC report on the subject is currently being drafted, for release in the new year, and is expected to include an updated price tag of installing barriers, a look at construction challenges and an analysis weighing the benefit against the cost to society and the TTC. "What's the value of time?" explained TTC chief safety officer John O'Grady. "You know, so we have all these delays … how much is that worth to the people of Toronto?" In the meantime, other anti-suicide tactics continue to fill the gap. Every TTC subway station has at least a few posters aimed at distressed people. Avoiding euphemism, they bluntly ask passengers if they're "thinking of suicide." If so, people are encouraged to call 416-408-HELP. "There is help. Let's talk." The TTC has also trained staff in what they call the gatekeeper program. Employees are encouraged to watch for possible signs of suicide intent – including abnormal behaviour such as missing several trains or disrobing – and approach people who could be at risk. At GO, agency staff are also trained to watch for indications of distress. And signs publicizing a crisis help line run by Connex Ontario started going up a few years ago. "Need to talk? We're here," they offer, urging people to call 1-866-531-2600. The signs stemmed from a sense of urgency GO Transit head Greg Percy felt after attending a conference on rail suicide. He came away thinking the agency had to do more. "We're at 800 signs, and counting" Mr. Percy said. "On every level crossing … we put them on the four corners of the level crossing, put them on every platform." The agency has also been working to protect its network, installing different types of fencing along the tracks depending on the probability of incursion. The highest-security fencing is the most difficult to climb or cut through, but it's pricey – running about $165,000 per kilometre – and GO can't afford to line its whole network with it. The agency also relies also on train crews to keep watch and send back warnings about people near the track. In some of these cases, the next train will get a slow order, or may be stopped temporarily. A decision on whether to do that, though, has to be balanced against the need to keep the transit system running. "I've heard it said this way," said Bill Grodzinski, head of GO security. "If we stopped for every trespasser we saw, the trains would never move." When a person is hit by a train – whether by accident or otherwise – the TTC calls it a Priority One. Every TTC subway station has at least a few posters aimed at distressed people. The TTC has trained staff in what they call the gatekeeper program. Employees are encouraged to watch for possible signs of suicide intent. One Thursday evening Mr. Percy got an alert that a GO train had hit someone. The notices are a routine part of his role as leader of the transit agency, but he didn't know how close to home this one would be. The next day his teenage son, then a high-school football player, called to say that night's game had been cancelled. The victim had been one of his teammates. "The kid showered up after practice and walked up to [the] level crossing and waited for a GO train and walked in front of it," Mr. Percy said. "The tragedies are never as far away as you think." So far this decade, 72 people have killed themselves using a GO train. At least 78 more have died jumping in front of a TTC train. "They always represent a knock on the door, where a family's going to get the worst news they possibly can," said Mr. Grodzinski, the head of GO security. "This impacts far more than the people on the train, the victim, the victim's family. Communities are traumatized by this as well." Fatalities using GO trains are concentrated on the lines with the heaviest service, in keeping with international research that links frequency of trains with incidence of suicide. The Lakeshore East and West lines alone account for about 60 per cent of the GO-train-related suicides so far this decade. There are relatively few suicides on the weekend. Other than Wednesday, when the number of incidents drops down nearly to weekend levels, these deaths are spread throughout the week. January and October are the worst months, with a relative reprieve coming in February and March. Among those victims for whom gender and age could be ascertained, they are roughly 80 per cent male and their average age is in the late 30s. Although the TTC refuses to release location data for their suicides, The Globe and Mail has been able to glean from public alerts, witnesses and media reports the sites of most of the fatalities over the last four years. One well-travelled downtown station on the Yonge-University-Spadina had the most of all: more than nine times the number it would have seen had the incidents been distributed randomly. In general, though, more lightly-used stations seem to have more fatalities. And the data shows that the less-busy Bloor-Danforth line has a considerably higher rate of suicides than the Yonge-University-Spadina line. The Montreal-based Centre for Research and Intervention on Suicide and Euthanasia says that if there are high-suicide spots, "local actions at and near hot spots may save lives with relatively limited investments." Doing so does not tend to drive suicidal people to other spots, they argue. The TTC's Mr. O'Grady warned, though, that looking at recent years doesn't necessarily tell the whole picture. "You take a five-year cohort, you look at it, and it's different from the previous one," he said. "My belief is there isn't really any [location] pattern." Since the start of the decade, suicide incidents on the TTC have been spread fairly evenly through the week, with the highest likelihood Monday through Wednesday. More than one-third of the victims were female – far higher than national statistics on suicides by violent means, which usually are heavily weighted towards males – though men who jumped were more likely to die. The average age among all victims, where known, was in the late 30s. November was the worst month for fatalities but May the worst for overall incidents. Along with February and September, May also had the lowest average age among those people jumping. 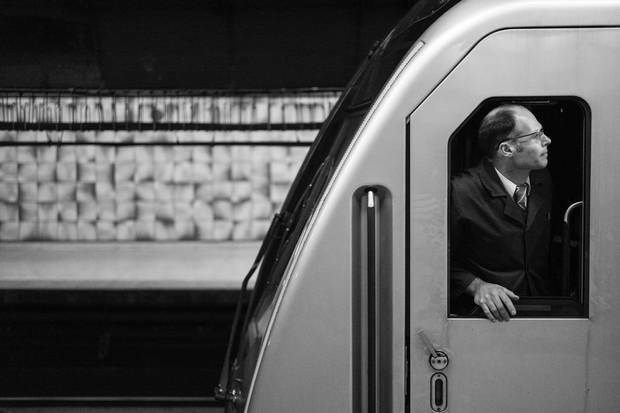 Suicide is complicated and there is rarely a simple explanation for someone's decision, however research suggests some commonalities among those who choose suicide by train. 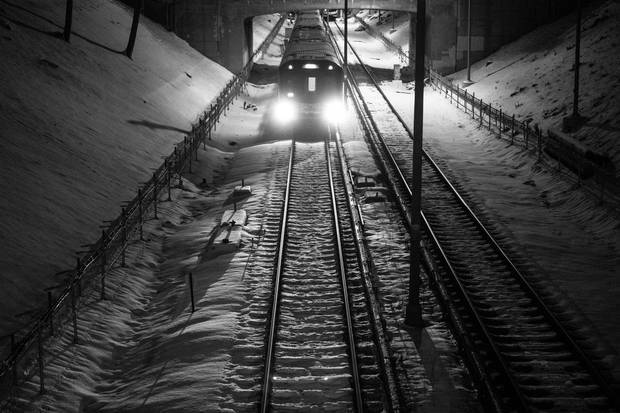 "Suicide victims intentionally go to the metro to kill themselves, often tell others beforehand, and are generally in treatment for serious psychiatric problems," wrote Montreal academic Brian Mishara in a 1999 paper for the Canadian Journal of Psychiatry on suicide in that city's subway system. Dr. Paul Links, who works now at St. Joseph's Health Care London, was for years the go-to expert psychiatrist on transit suicide in Toronto, where he assisted with the TTC on their suicide programs. He said that using a train can be a choice for people without the money to afford another method, it may reflect a high level of intent because it is perceived, wrongly, to be a sure thing, and it might involve mental illness serious enough to overpower revulsion at the method. "Maybe they're so distressed with severe symptoms this becomes an option to end their life," Dr. Links said in a phone interview. "They tend to be people who don't have a lot of resources." A study of survivors of suicide attempts in the London Underground for the Journal of Urban Health found that 90 per cent "felt certain that they would die." But the death rate in most transit systems is substantially less. 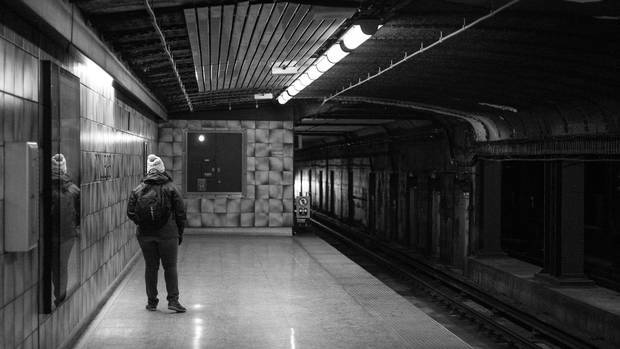 So far this decade at the TTC, 70 people, roughly half of those who tried to kill themselves in front of a subway train, survived long enough to leave the station. Among those listed as a survivor was the youngest-known victim: a 15-year-old girl who tried to kill herself in May of 2013. However, the TTC data obscures the real toll as their fatality statistics generally don't include those who die later. "What you get as a surgeon is you get usually a fairly badly injured patient with all sorts of grease all over them," said Sunnybrook's Dr. Richards. "I mean, it's like someone poured black paint over them." Partial data from Sunnybrook and St. Michael's Hospital suggest that approximately 30 per cent of those who survived being hit by a subway train over the last five years (including some hit by accident) died in hospital. If those figures are representative of longer-term trends, the number of people killed in TTC suicide attempts so far this decade is likely to be around 100, and possibly higher. Crush and organ injuries, multiple amputations, burns and head wounds are all possible, with survivability dependent on age and severity of damage. "They tend to cause a lot of damage, and much of that damage is obvious externally," said Glen Bandiera, chief of emergency medicine at St. Michael's Hospital. "If a patient makes it through the first sort of 24 hours in an acute care environment and through their first trip to the operating room, to the ICU, then the likelihood is that more than half they'll end up leaving hospital." The wounds suffered by train suicides are severe enough, Dr. Bandiera said, they can jar even seasoned hospital workers, one of many groups caught up in the trauma that radiates out from these incidents. The effect on train crews who hit someone is also understood now in a way it wasn't in decades past. In the old days, a staffer might be back at work the next day. With new recognition of post-traumatic stress disorder, employees involved in these incidents are removed from the scene as quickly as possible. It is normal for them to feel guilt and anger and suffer flashbacks and panic attacks. Employees get counselling and sometimes take months to return to work. It can also be traumatic for bystanders. 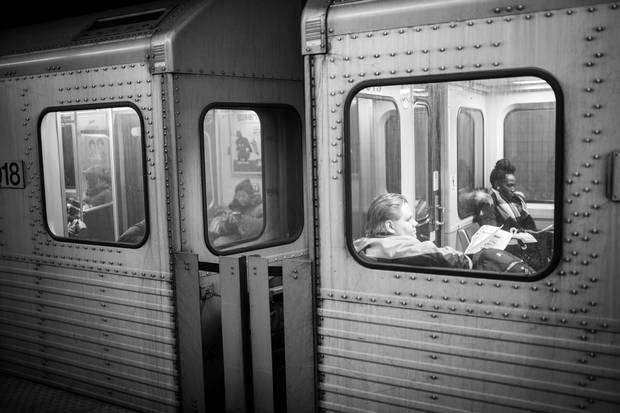 A witness to a TTC suicide described it as being almost too much to take in. It was late on a Tuesday morning this summer and there were few people on his downtown subway platform. A man suddenly jumped down and squatted in front of the onrushing train. The witness, who asked to be identified only as Joseph, said it took time to process the incident and the effects lingered. Every time he heard a thud on the TTC he would think it was another suicide. And the memory would pop up in other places. "I remember I was writing an exam and I panicked a little bit, because I heard the sound, in my head, of the body getting ripped apart," Joseph said. "I hear it once in a while." Note: Stories of suicide can be difficult to read. If you're dealing with mental-health concerns, help is available. If you're in crisis or in need of assistance, call 416-408-HELP, go to your nearest hospital or call 911. TTC staff keep watch at the security booth at Yonge/Bloor subway station. When a person is hit by a train – whether by accident or otherwise – the TTC calls it a Priority One. The internal alert at GO simply says a trespasser has been struck. At both agencies, it is one of the most difficult logistical issues for staff as they deal with a tragedy while under pressure to get the service running again. Everyone is keenly aware that time is of the essence and, to speed up the process, both agencies have established good relationships with police and the coroner's office. But just getting to the scene can take time. There's also the need to treat the person's remains with dignity and ensure a crime wasn't committed. Suicides using GO trains are typically not in stations and can be in hard-to-reach spots. 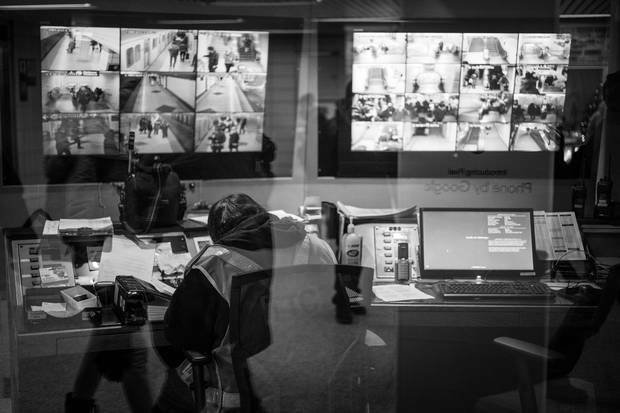 The agency prepares for rush hour by positioning security officers in areas they know are more likely to see suicides. In some cases officers will use bicycles to get to the scene, with goal is to be on-site within 30 minutes and clear the incident within 90. GO staff will typically arrive around the same time as police, who have notified the coroner's office. Photos are taken. The train's crew is subject to drug and alcohol testing and Bombardier, which is contracted to operate these transit lines, sends out a replacement crew. The victim's remains, which may end up anywhere along the length of the trains, are collected. Police interview the crew and watch video of the incident from a camera on the front of the train. Once the coroner has deemed it either suicide or accident, the train is released to proceed to the next station so passengers can disembark. The train is then taken out of service for mechanical checks and cleaning. "Our goal is to, as quickly as possible, release that train," said GO security head Mr. Grodzinski. "Customers will generally put up with an hour, hour and a half, on the train … once you exceed that 90-minute threshold, it starts to spiral. The medical emergencies, the panic attacks. Just the patience has worn out. And unfortunately in the past, going back five-plus years, it was not uncommon to have people trapped on those trains three-four-five hours in worst-case scenarios." 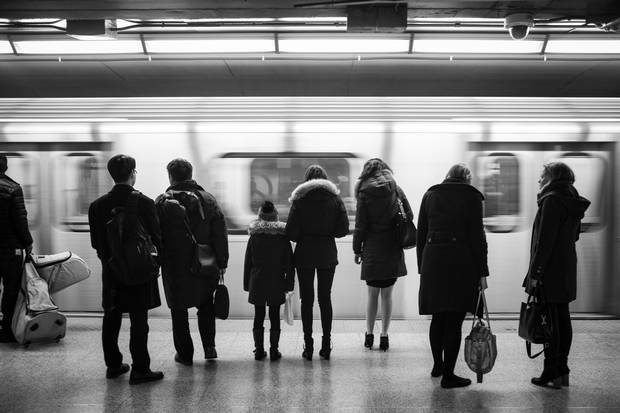 TTC suicides are invariably at or near stations, making them easier to reach. Subway stoppages average about 60 minutes for a Priority One. But with the TTC carrying vastly more people than GO, even a short delay can have catastrophic effects on the system. As soon as the power is cut, crews get passengers out of the train and off the platform. The nearest TTC chief supervisor, four of whom are stationed throughout the city, has by now been dispatched. Police, paramedics and TTC special constables converge on the scene. Victims can be hard to access, sometimes stuck under the train or wedged into the crack between the vehicle and the platform. If they are dead, EMS will pronounce them at the scene. Police interview the crew, who are taken off-duty, and watch the platform video. Transit constables photograph the scene. Once the coroner – whose office has been contacted by transit control – has deemed the death is a suicide, the train can be moved. This can allow easier access to the body, and also let other trains stranded nearby in the tunnels to get to the nearest station and let their passengers leave. TTC crew collect the remains, which are taken to a nearby room, with a police officer stationed at the door. Service resumes after the chief supervisor has signed off on the condition of the track. "Over the last probably 25 years the condition you leave the track in before you resume service has gone way, way higher," said head of subway operations Jim Ross, who oversaw around eight deaths in his time as a chief supervisor. "There's a lot of different complications to cleaning up. It depends. Some of them are pretty good. Some of them are not." 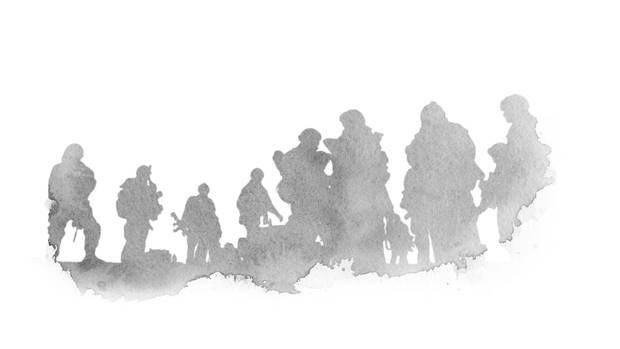 The Unremembered: A Globe and Mail investigation Read The Globe's full coverage of soldiers and veterans who died by suicide after deployment during the Afghanistan mission, and what Ottawa is doing to help them.